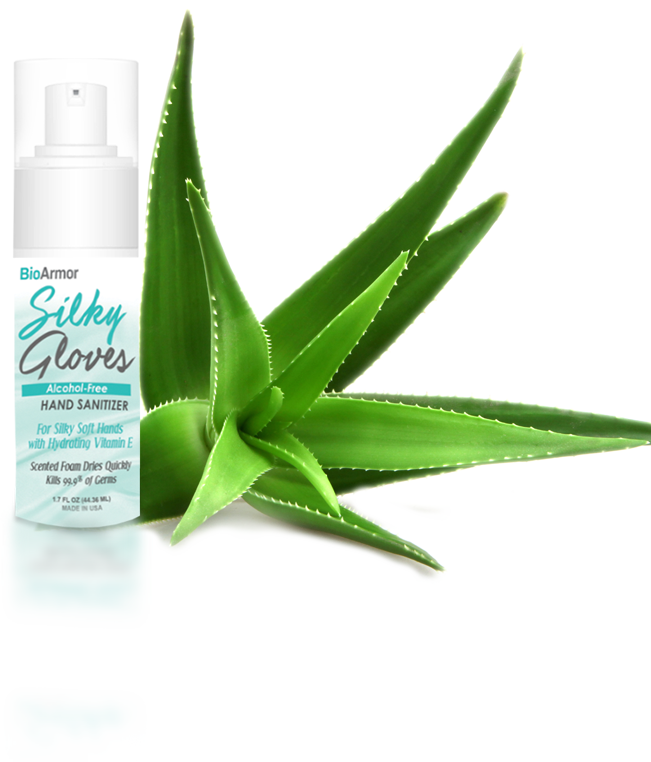 BioArmor™ Silky Gloves Hand Sanitizer is an alcohol-free, non-toxic antimicrobial hand sanitizer that safely disinfects, killing 99.99% of harmful germs, bacteria and micro-organisms, while keeping hands soft and moisturized with aloe and vitamin B-5. How Is Silky Gloves Different? Understanding the science that’s behind our products will allow you to discover the BIOARMOR difference. Silky Gloves is a non-toxic, pleasantly scented hand sanitizer and disinfectant that naturally kills 99.99% of harmful germs, bacteria and micro-organisms. Harmful germs, bacteria and micro-organisms are carried person-to-person as well as persons infected by touching inanimate objects such as hard surfaces, door knobs, hand rails, keyboards, touch screens, PPE, etc. The technology utilizes 4th generation nanotechnology to safely protect you and your environment from cross contamination and the spread of germs, bacteria and micro-organisms, leading to illness and infections. Bioarmor Hand sanitizer was accepted and has been used at the Bioterrorism Task Force labs at the CDC in Atlanta, to protect staff from germs and bacteria. Benzalkonium Chloride, is the trusted active ingredient that has been used in Bactine as an antiseptic since 1950. Used as a germ killer, preventing infections and first aid treatment keeping skin healthy. BioArmor™ Silky Gloves Hand Sanitizer contains no alcohol or toxic chemicals. Instead it is comprised of a natural formula to safely protect you and your environment from the spread of harmful germs, bacteria and micro-organism growth. Alcohol-based hand sanitizers contact 60%-95% percentages of ethyl alcohol and toxic chemicals to poison germs, making the sanitizer highly flammable and dangerous. It is the alcohol/chemicals in the products that kills germs however, it kills not only the harmful germs but also the natural flora on the skin. Killing the good germs means that surfaces become susceptible to issues such as infections and damage to the skin (i.e. Skin dries out and cracks opening the skin to infection and illness). This means that as soon as the alcohol based hand sanitizer has dried or evaporated from the skin, it becomes less effective in killing and leaves your hands highly susceptible to re-contamination and/or infection. BioArmor™ Silky Gloves Hand Sanitizer kills 99.99% of the harmful germs it comes in contact with by disrupting the outer cell membranes and resulting in a physical kill (Lysing) of the microorganism. This physical kill ensures microorganisms do not adapt or become resistant to the BIOARMOR antimicrobial product. This antimicrobial technology is extremely effective because it kills the bacteria before colonies can be formed. 150 North Research Campus Dr.